The trees are budding throughout southern New England and we all welcome the unfolding spring. We see pockets of red haze for the maple trees interspersed with green fuzz for the other varieties. Have you ever looked at tree buds closely? Try looking trough the lens of a camera. Here a few photos I took this morning. 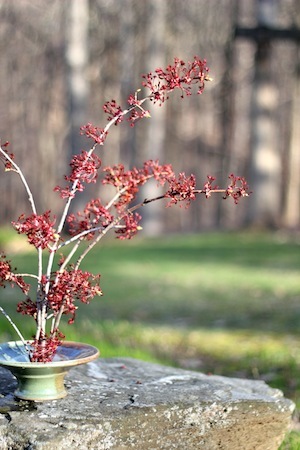 And then, this afternoon I decided to pick some of the red buds for a centerpiece with an oriental twist. The challenge is most of the tree buds are too high. By backing up the pick up truck and standing in the bed with a pair of long handles clippers I was able to harvest a bunch. 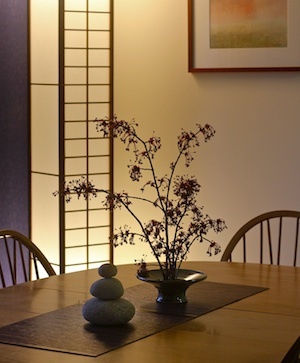 I arranged them in a new handcrafted vase I got from Touchstone Pottery at the recent Paradise City Craft Fair in Marlborough, MA. 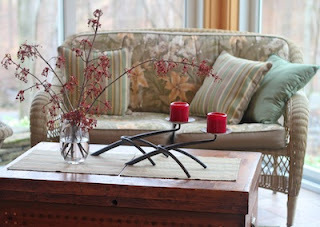 Here they are in a clear Crate and Barrel vase combined with two candles in the sunroom. I combined it with a stone tower on a woven mat for the dining table. It created a very contemporary centerpiece and I love the essence. Now I get to see how long before the buds drop.